The R&B Breakout Talks Boy Band Past, New Found Freedom, and Style. Merrygold is destined for the top. September 15, 2018 | Aston Merrygold manages to kick down every door he comes across. A vocal that lands somewhere between Michael Jackson and Big Sean, the English R&B singer has confidence for days, a charm that's downright addicting and an arsenal of tracks that blur genres in exciting ways. "Across My Heart," a house-lite collaboration with Grawler, his Bruno Mars-worthy "Get Stupid," and any number of tracks from 2017's Precious EP will blessedly get the pulse rate up and inspire you to try out a few of those dope new dance moves in the club. He's unconcerned with staying in one genre box and often finds himself fusing the big band style of the '50s and '60s with a groovy classic soul with the runway swagger of today's youth. He's bodacious and radical and the kind of talent that is destined for superstardom from the start. 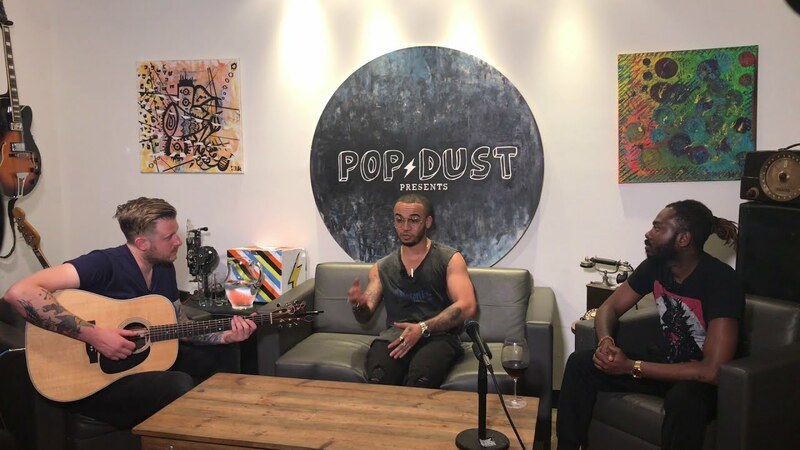 Earlier this summer, Merrygold took the Popdust office by storm, performing a pair of tracks, including a sizzling Michael Jackson cover. Prompted by host Deascent, the singer discussed his upbringing just outside of London, competing on The X-Factor, working in a boy band, and his new grinding R&B style. Watch the interview above. Hitting the 10-year anniversary since coming in second place, as part of the boy band JLS, on The X-Factor UK, Merrygold is primed and ready for his solo breakthrough. His voice hits hard, and his back beats hit even harder, often becoming so lodged in the brain, you can't think about anything else. The band was together for an impressive five years, and after the split, he took a stint on the panel of UK's dance competition Go to Dance. That wasn't the end of his primetime days, either. He later competed on Strictly Come Dancing, on which he ended up on 10th place. But through the rollercoaster ride, his cheery disposition never faltered. His single "Get Stupid" dropped in 2015 and led to last year's rave-heavy EP. He continues fine tuning his long-awaited debut long-player, which was originally planned for early 2016. Signed to Warner Brothers, he issued other such one-off singles as "One Night in Paris" and "Trudy." Merrygold's style is thrilling, and you'd be hard pressed to not be able to recognize the honesty in his style. He commands attention while always trying to brush off the camera. But that has got to be a natural reaction, considering he's one of seven children, so he's used to sharing the limelight. However, his youth is populated with other talent gigs, including Stars in Their Eyes in 2002 and Fun Song Factory in 2004, starring alongside Laura Hamilton. The hard work will surely pay off, and while we wait with bated breath, these acoustic performances will have to do.